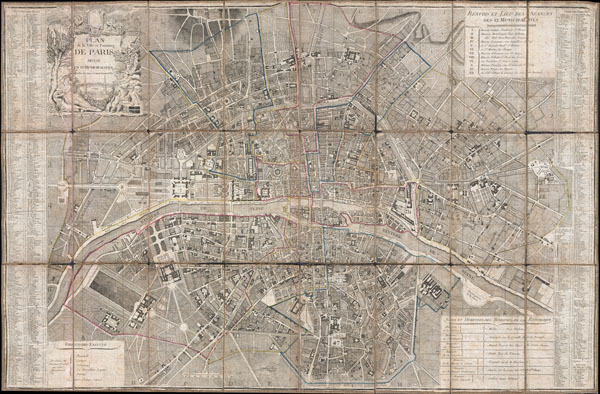 Extraordinary large format case map of Revolutionary Period Paris, France. Plan de la Ville et Faubourg de Paris Divise en 12 Municipalites. An extraordinary map of pre-Haussmann Paris and the early Faubourgs (suburbs) issued in 1797, during the final days of the Directory and the French Revolution and just two years before rise of Napoleon Bonaparte. Covers Paris on both sides of the Seine from the Champ de Mars to Le Trone, extends north as far as Montmarte and south roughly to Port Royal. Produced at the height of French dominance of the cartographic arts, this map is a masterpiece of the engraver's art. Individual buildings, fields, streets, hills, valleys, orchards, and public gardens are revealed in breathtaking detail. We can even see the incomplete state of the northern wing of the Louvre Palace. There is an elaborate street index on either side of the map. In the lower right quadrant appears a list of names of the Ministers of the Republic and members of the Directoire Exécutif. An allegorical title cartouche containing cherubs, a maiden, and a view of the a bridge (the Pont Neuf ?) appears in the upper left quadrant. This type of map, known as a pocket or case maps, is designed with the traveler in mind and while it displays beautifully unfolded, is designed to fold and fit in a vest or coat pocket. It accordance with its purpose, the map has been dissected and mounted on linen in 24 sections. This system was devised in the 18th century to protect folding maps against damage caused by repeated folding and unfolding. The linen backing absorbs the stress of folding and can easily be mended or replaced, thus preserving the integrity of the actual paper document. Folded this map fits into a beautiful brown tooled leather slip case, which is included. Pierre Jean (1754 - 1829) was a French engraver, publisher, print seller, and map maker active in Paris in the late 18th and early 19th centuries. Jean entered the engraving and printing business on June 7 of 1784 when he married the daughter of Louis-Joseph Mondhare, a prominent French engraver, print seller and map publisher. Mondhare changed the name of his firm to Mondhare & Jean. Under Mondhare, for about 12 years, Jean mastered the in-and-outs of the engraving and map publishing business. Mondhare retired in 1796, leaving Jean his business and printing plates. Jean subsequently continued to publish on his own account, as Chez Jean, from the old Mondhare & Jean offices at 32 Rue Saint-Jean de Beauvais. Very good. Paper is in excellent condition with only minor wear at edges. This map has been dissected and mounted on sailcloth in 24 sections. Original linen backing intact but extremely worn and fragile - split at a few points. Comes with its original leather binder, which is in very good condition.